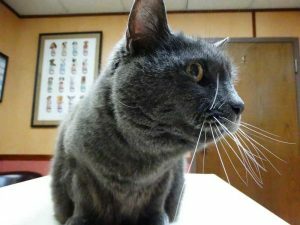 Facts on high blood pressure and Chronic Kidney Disease in senior cats, presented by our 18 year old Patient of the Day, Grayson! High blood pressure and Chronic Kidney Disease are both common problems in senior cats. Kidney disease affects nearly 11% of cats, and the incidence increases as pets age. 75% of cats with high blood pressure also have Chronic Kidney Disease. 65% of cats with Chronic Kidney Disease also have high blood pressure. It is very important to routinely screen for both high blood pressure and Chronic Kidney Disease in senior cats in order to best manage these conditions and prevent complications. Although Grayson was diagnosed with early Chronic Kidney Disease a year ago, her blood pressure has luckily remained in the normal range for cats!